The new phone benefits from touchscreen and Symbian Anna, but is it the business? The Nokia E6 follows on from its E-Series QWERTY predecessors such as 2010's Nokia E5, providing the best E-Series camera yet, touch screen navigation and the home screen capabilities of the Symbian^3 platform. The Nokia E6 is priced at £320, twice the price of its simpler sibling, the Nokia E5, but £80.00 cheaper than its weightier big brother, the Nokia E7. When we compare the Nokia E6 with BlackBerry's offerings it is slightly cheaper than the non-touch BlackBerry Bold 9780, at £340. When we compare sizes, the Nokia E6 (115mm x 59mm x 10.5mm) is slightly slimmer than the E5, while both are longer, but narrower and thinner than the BlackBerry Bold 9780 and narrower than the chunky BlackBerry Bold 9900. If we then compare the weight, the Nokia E6 has a comforting weight of 133g, making it the heaviest of the bunch, with the Nokia E5, BlackBerry Bold 9780 and BlackBerry Bold 9900 weighing 126g, 122g and 130g respectively. This increased weight contributes to the Nokia E6's feel of robustness and high build quality, rather than making it feel unwieldy. Another area which is often compared is the processing power of these powerful phones, with the Nokia E6 sharing its 680MHz ARM11 processor and 2D/3D graphics hardware acceleration with the Nokia E7, beating the BlackBerry Bold 9780's 624MHz processor. The BlackBerry Bold 9900 with its 1.2GHz processor beats the Nokia E5 though. But, until the Bold 9900 becomes available for testing, we can't say whether this difference is worth the likely higher price. 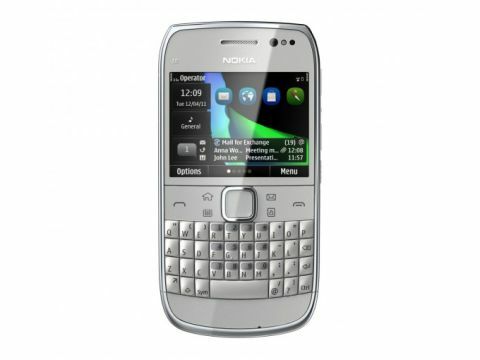 The E6 is the first Nokia handset to come preloaded with Symbian Anna OS upgrade, providing numerous improvements over the initial Symbian^3 firmware installed on the Nokia N8, Nokia C7, Nokia E7 and Nokia C6. These include a faster web browser, improved text input, a split screen view during touchscreen typing, a portrait QWERTY for touchscreen typing, new icons and Ovi Maps 3.06 pre-installed. The text improvements aren't visible on the Nokia E6, however, as all text input is achieved via the physical True-Type-esque keyboard. All of the other enhancements are present though. Scrutiny of the OS improvements provided by Symbian Anna finds that the only real improvement on the Nokia E6 is the improved browser, as Ovi Maps can be downloaded separately for free and the new icons are available in Symbian next+ mentioned in the Interface section of this review.